A record harvest and continued investment set the stage, while Cabernet Sauvignon's dominance steals the show. Washington vineyards like Waterbrook (pictured) are bringing national notoriety to the state's high-quality, low-priced Cabernet Sauvignon. Washington restaurants pour wines from the state’s 14 AVAs, and that’s expected at places like RN74 in Seattle or The Marc Restaurant at the Marcus Whitman Hotel in Walla Walla. Less expected are two resorts in Northern California where guests get turned on to Washington. Chip Ermish, wine director of the Landing Lake Resort in Lake Tahoe and the Sierra Nevada Resort in Mammoth Lakes, says his customers are well-versed in California wines, so he introduces them to Washington’s offerings—and they’re astounded by the quality. “Washington is wine’s next frontier,” Ermish says. “The state’s gems pair well with food, are lower in alcohol, are approachable upon release and are attractively priced.” The 2015 Gilbert Cellars Columbia Valley Chardonnay ($14 a 6-ounce pour) sells so well at the resorts’ four on-premise venues that he no longer offers it by the bottle. Two Bordeaux-style blends, the 2012 Columbia Crest Walter Clore Private Reserve Columbia Valley ($70 a 750-ml.) and the 2009 L’Ecole No. 41 Apogee Pepper Bridge Vineyard Walla Walla ($150) are also strong sellers. Washington produced 17.5 million nine-liter cases of wine last year, a jump of 5 million cases since 2014, according to the trade organization Washington State Wine Commission. Since then, winery revenues have doubled to more than $2 billion. Of the state’s 900 wineries, about 60 produce more than 10,000 cases a year, with most of the remaining wineries making fewer than 5,000 cases. Washington is the country’s second-biggest wine producing state after California, and its first AVA was declared just 35 years ago. It has roughly 55,000 acres under vine, and most predict that will rise to 200,000 acres without stress on the state’s natural resources. Following three impressive vintages, the 2015 crop was smaller due to record-breaking heat, though the 2016 crop was the largest ever at 270,000 tons, due to new plantings and heavy clusters. Cabernet Sauvignon—now the state’s top varietal—comprised 26 percent of the 2016 harvest, a 50-percent gain over 2015. Following in volume were Merlot, Chardonnay, Riesling and Syrah. Red grapes comprised 58 percent of the harvest. 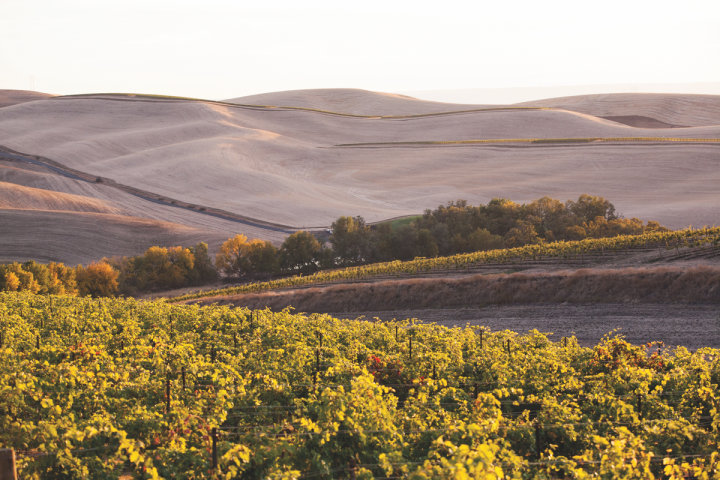 Washington combines ideal terroir for northern French varietals with reasonably priced land, attractive production costs and advances in the vineyard due in part to the new Wine Science Center at Washington State University Tri-Cities. 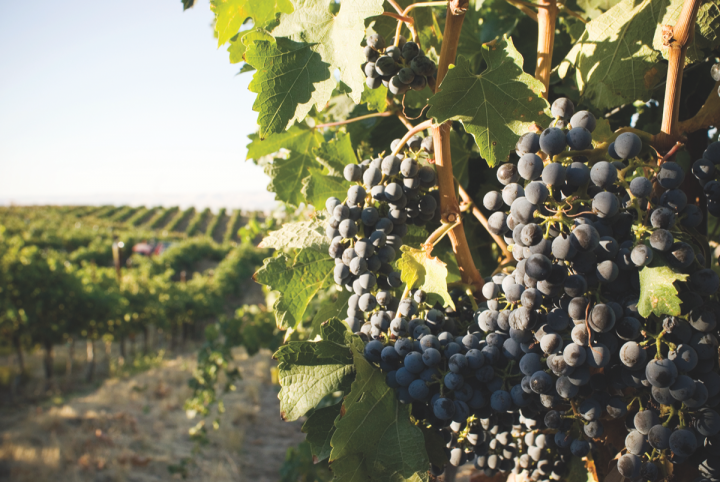 These advantages, along with the potential for growth, continue to draw investment from out-of-state companies, which have purchased, launched or partnered with Washington wineries. Italy’s Marchesi Antinori pioneered investment in Washington 20 years ago by partnering with Chateau Ste. Michelle to create Col Solare, a Cabernet Sauvignon from the Red Mountain AVA. In the last few years, outside investment has escalated. E. & J. Gallo owns the Columbia Winery and Covey Run brands, while Banfi Vintners owns Pacific Rim, the brainchild of Rhône Ranger Randall Grahm. In 2014, Kobrand Wine & Spirits launched Mullan Road Cellars, a Columbia Valley red blend by St. Helena winemaker Dennis Cakebread; in the same year, Napa-based Duckhorn Vineyards created Canvasback, another Red Mountain Cabernet. 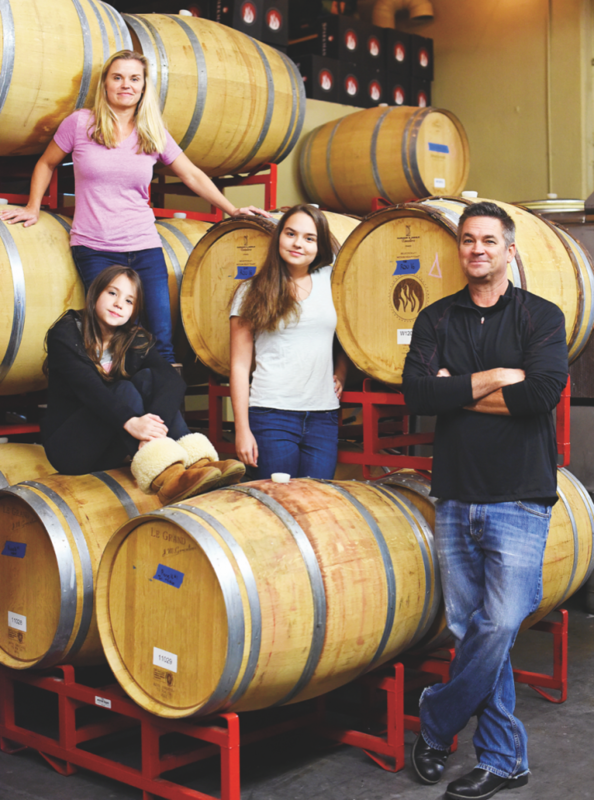 Meanwhile, Crimson Wine Group owns Seven Hills Winery in Walla Walla and Double Canyon Vineyards near the Horse Heaven Hills, and Sonoma-based Vintage Point has two Washington brands, Julia’s Dazzle rosé and Nine Hats. 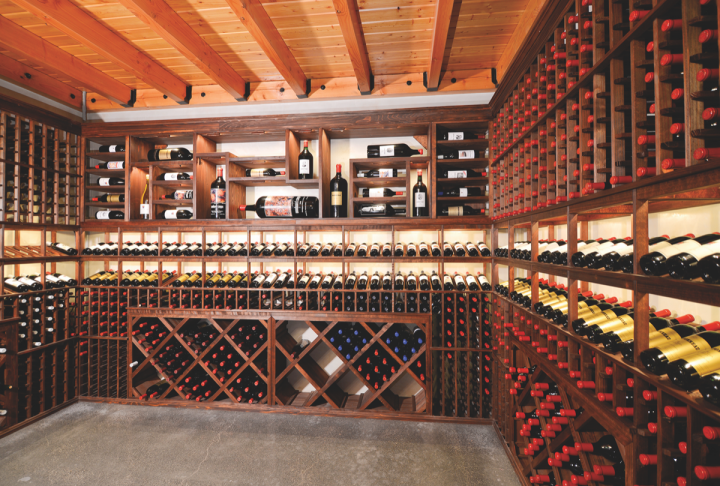 Terlato Wine Group recently purchased Klipsun Vineyards, an esteemed Red Mountain property. Constellation Brands—owner of Hogue Cellars, which has more than 20 Washington wines priced from $8 to $30 a 750-ml.—recently bought Charles Smith’s five core Columbia Valley wines: Velvet Devil Merlot, Kung Fu Girl Riesling, Eve Chardonnay, Boom Boom Syrah, and Chateau Smith Cabernet Sauvignon (all $13 to $20 a 750-ml.). Charles Smith will continue to make the wines, which have grown by double digits over the past three years. “Our investment in Washington is in large part due to the high quality grape growing and winemaking coming from the state,” says Jon Guggino, vice president of marketing for premium, super-premium and global import wines at Constellation. For the acquired wineries and vineyards, leadership, winemaking and grape contracts have remained largely unchanged. This trend is likely to continue. Steve Warner, president and CEO of the Washington State Wine Commission, says winery owners may sell in order to grow their businesses and gain access to larger distribution networks, or they may sell as they near retirement age. “When investors compare the quality of Washington’s wines to our prices for a ton of grapes or an acre of land, they realize investment here is a wise business decision,” Warner says. Washington-based winery executives—including those from small- to medium-sized wineries—tell Market Watch that continued investment will benefit the industry as a whole. The upside is clear. “Washington’s potential for winegrape growing is incredible, and I feel more confident about investing there than perhaps anywhere else I produce,” says Charles Bieler, who, with Charles Smith, co-founded the Charles & Charles brand, marketed by Trinchero Family Estates since 2013. The partners make five wines line-priced at $15 a 750-ml., led by their rosé and Cabernet Sauvignon–Syrah blend. In 2016, shipments grew 30 percent and depletions grew 50 percent. Bieler says Washington provides a diversity of soils, good access to water and an ideal climate for grape cultivation. The top five Washington brands in the United States are all from leading player Ste. Michelle Wine Estates (SMWE), including flagship Chateau Ste. Michelle, 14 Hands and Columbia Crest, according to Impact Databank. Chateau Ste. Michelle celebrates its 50th anniversary this year with a new hospitality center and updated packaging. Washington wine accounts for most of the company’s wine volume, and shipments of Washington wine increased 5.4 percent in 2016. SMWE’s top three Washington wines are the Chateau Ste. Michelle Columbia Valley Riesling ($9 a 750-ml.) and Chardonnay ($11), and 14 Hands Hot to Trot red blend ($10). Washington's Ste. Michelle Wine Estates produces the top five Washington wine brands in the United States. 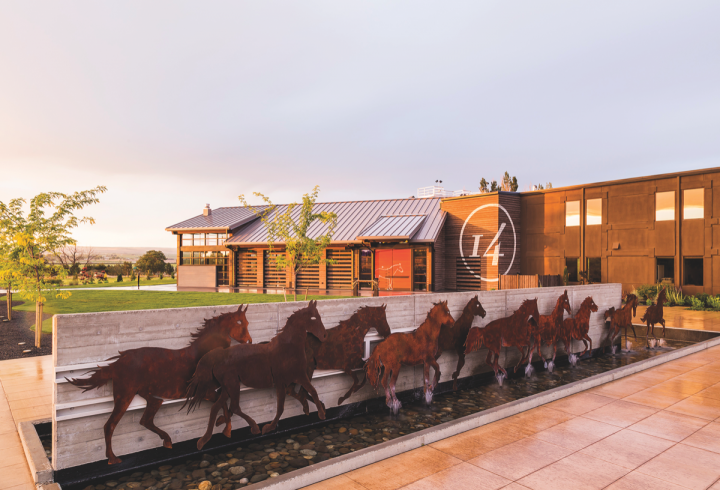 The company's 14 Hands label (winery exterior pictured) is red wine heavy, with a diverse array of Cabernet Sauvignons, Merlots and red blends. Precept Wine produced 663,000 nine-liter cases of Washington wine in 2016, an increase of about 5 percent over 2015. Among the company’s top brands are Waterbrook ($12 to $23 a 750-ml. ), Canoe Ridge Vineyard ($16 to $40) and Browne Family Vineyards ($19 to $80). The company also produces Washington wines exclusively for Total Wine & More, Whole Foods Market and other sellers. The company has added to its Washington vineyard holdings and opened a Browne Family tasting room in Seattle. Cabernet Sauvignon and red blends are Precept’s fastest growing categories, particularly for labels priced in the teens, says owner and CEO Andrew Browne. “Cabernet Sauvignon is going to be huge for Washington, and I’m bullish on Washington Cab,” Browne says. He describes Washington Cabernet Sauvignon as a cross between Bordeaux and California—balanced with good acidity. Browne also notes growing interest in Washington Cabernet Sauvignon in on-premise accounts nationwide. Browne and SMWE’s Baseler agree that the Washington wine industry’s underdog status prompts its innovation. “Washington is made up of mavericks, and that creative spirit propels the state’s wine industry,” Baseler says. “We’re challenged to work harder,” says Browne, adding that the diverse terroir also leads to experimentation. “Washington’s varied terroir and our ability to control irrigation give us a huge range of clones to plant,” Browne says. Not all the investment will come from out of state, says Rick Small, owner of Lowden-based Woodward Canyon, which has annual production between 15,000 and 20,000 cases a year. He predicts SMWE and Precept will continue to invest in the state’s wine industry, even as capital flows in from outside the state. 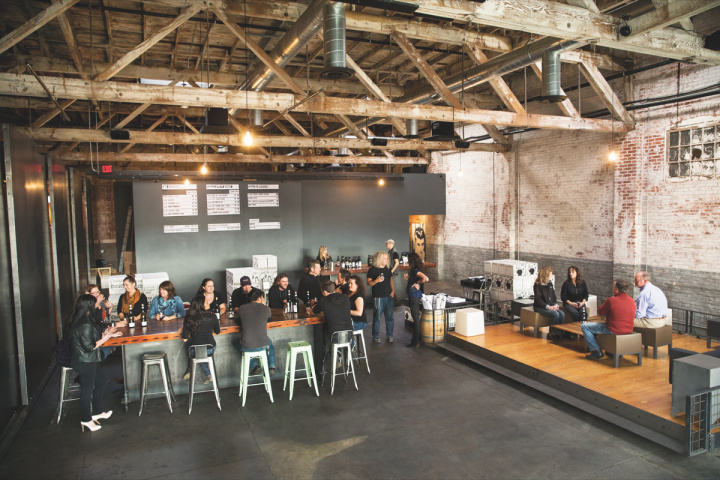 “Investment is a sign that Washington vineyards are being taken seriously, and smaller wineries can benefit from the larger companies’ distributor networks,” Small says. He forecasts further investment in Walla Walla and Red Mountain, which are undervalued compared to Napa and Sonoma. Washington’s challenges include access to market, potential confusion due to the large number of varietals produced and competition from European wines in East Coast markets, according to Small. Woodward Canyon’s top-selling wines are its Artist Series Columbia Valley Cabernet Sauvignon ($59 a 750-ml.) and its Old Vines Washington State Cabernet Sauvignon ($99). Chris Sparkman, owner of Woodinville-based Sparkman Cellars, also endorses continued investment in the state’s wine industry. “Duckhorn, Cakebread and Terlato have cast their votes for Washington,” he says, adding that he recommends incremental growth and noting that Washington’s challenges include access to market and increasing land prices. He predicts Cabernet Sauvignon will become the state’s signature varietal and that the Wine Science Center will provide an even stronger labor pool. Sparkman produces 12,000 cases a year, including top-selling Red Holler Columbia Valley Cabernet Sauvignon ($32 a 750-ml.). The Preposterous Red Mountain Malbec ($38) and Kingpin Red Mountain Cabernet Sauvignon ($62) are also strong sellers. Sparkman says Washington’s authentic family stories resonate with customers, and Jamie Stratton, wine director of the two-unit Jacob Liquor Exchange in Wichita, Kansas, agrees. “We’re huge fans of Washington’s terroir, people and prices,” Stratton says. He participated in the Washington State Wine Commission’s Road Trip program, where retailers and restaurateurs visit the state’s vineyards and wineries. Stratton subsequently increased the number of Washington wines at Jacob Liquors, and he has also been instrumental in finding distribution for Washington wines in Kansas. Every March, his team creates displays and hosts tastings for Washington Wine Month in March.